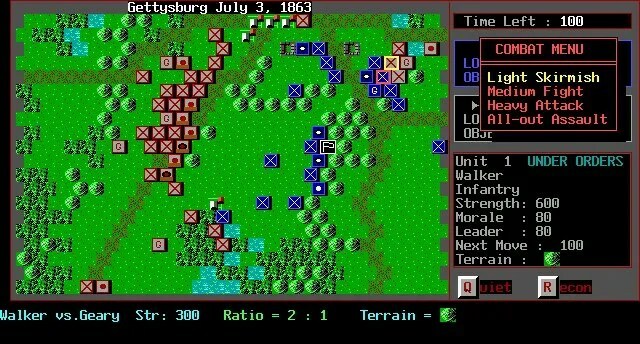 W.R. Hutsell’s EGA Civil War Battleset is a classic tactical-level wargame simulation of many battles of the American Civil War. It is currently available for FREE DOWNLOAD with the blessings of Mr. W.R. Hutsell. This game was written for MS-DOS, a predecessor to Microsoft Windows, as such, it takes a few moments of time to configure the application to run correctly. Gettysburg – July 2, 1863. Gettysburg – July 2, 1863 (alternate). Gettysburg – July 3, 1863. Antietam (Sharpsburg) – Sept. 17, 1862. The Bogs Crossroads – July 1861. Euclid Junction – August 1863. Chancellorsville – May 1, 1862. Cold Harbor – June 3, 1864. Ebenezer Church (Montgomery) – April 2, 1865. Fredricksburg – Dec. 13, 1862.